School Programme: the program of the school is devoted to project development for astrophysics & astroparticle physics. The aim of the school is to provide theoretical and hands-on training on Python development: python libraries, machine learning, C/C++ in Python. Please find more information here. Courses: the courses are available on Github as well as on Indico. Course duration : 8 April 2019 till 12 April 2019 (everyday from 9h00 till 18h00). Communication: a Slack community for the school is available for communication between participants, to ask questions to tutors, to get out, etc. School venue : CNRS-LAPP, Annecy, France. Accommodation Arrangements: shared accommodation arrangements (with breakfast) have been made for the school participants at the Centre Jean 23 Guest House. Please find more information here. Previous editions of the school : 1st, 2nd. What is H2020-ASTERICS: the Astronomy ESFRI and Research Infrastructure Cluster, ASTERICS, is a Research Infrastructure funded by the European Commission's Horizon 2020 framework. 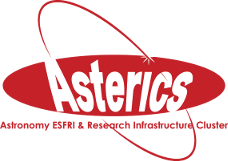 ASTERICS aims to address the cross-cutting synergies and common challenges shared by world class Astronomy ESFRI Facilities such as SKA, CTA, KM3NeT, LSST, LOFAR, EUCLID, EGO & ELT.